Material Design has put down its roots pretty deeply, slowly but surely affecting not only mobile but also web sphere. Its purpose is straightforward and old as the hills – to make interfaces more intuitive, coherent and handy for users. 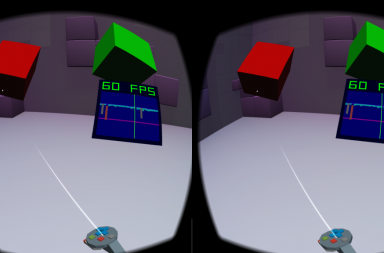 However, its implementation is pretty spicy and sophisticated. The visual language that Google tries to create is not just a medium; it is a philosophy, and that is much more than just following the rules. You should be committed to the doctrine, sticking to it and finding answers to your questions in here. Every detail should comply with the tenets. To make your path of embracing this ideology more smooth and beneficial we have prepared a list of helpful tools, resources, instruments and code snippets made for aficionados of Material Design. Material Flipside Button with animation. 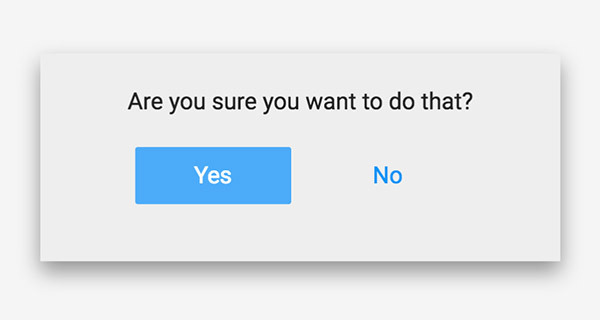 Be free to use this cool animation dialog that appears just after you click on the button. 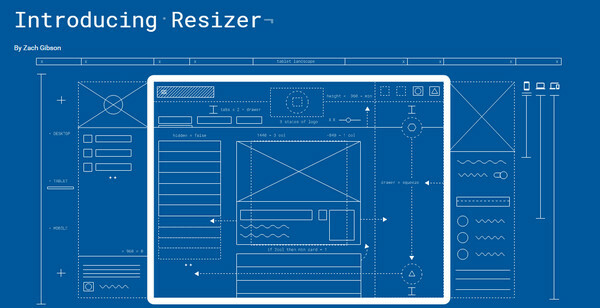 Resizer is an online tool for checking interfaces on responsiveness and mobile friendliness. The interactive preview clearly demonstrates products across various breakpoints. Material Palette is a generator of a harmonious yet vibrant and crisp color palettes. Choose two shades and the service will assemble the scheme, adding tones for accents, text, graphics and other details by itself. The result will be showcased on the window to the right and can be downloaded in several formats. Material Design Blog is an online magazine that is centered around brand-new Google Design language. It collects helpful resources, tools, plugins, articles, showcases, code snippets and other useful stuff dedicated to this field under one roof. 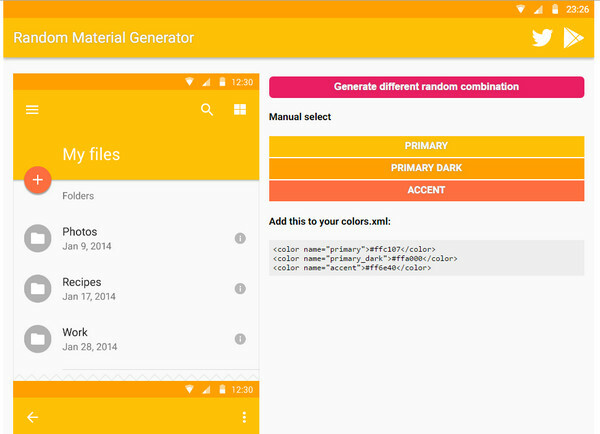 Random Material Generator is a composer for color schemes with a live preview. You do not have to pick up colors; the system will do everything by itself: just hit the CTA and enjoy the result. 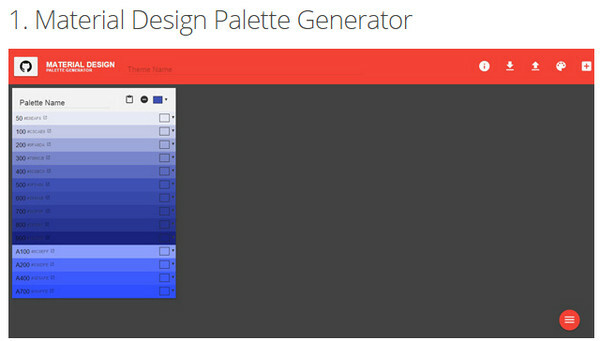 For those of you who need more online tools for building color schemes inspired by Material Design, we have found a small collection of generators. Gavin has gathered ten useful instruments that assist in this matter. Material UI is a portal that specializes in two main things: Flat Style and Material Design. Here you will find a vast color palette and a bulk of neatly crafted icons that are popular choices for interfaces that adhere to Google’s recommendations. 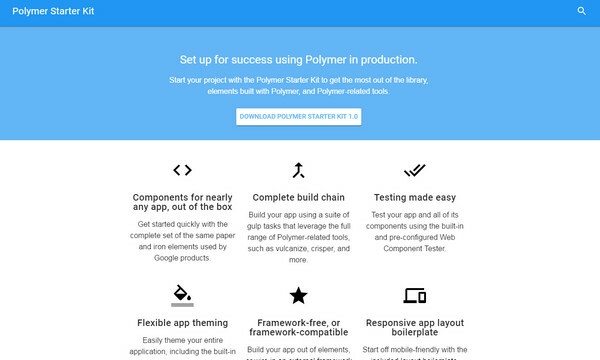 Polymer Starter Kit is a fantastic project by Google that is created in support of Material Design. The library comprises components for crafting applications, covering such vital stuff as responsive layouts, flexible themes, testing instruments and much more. Sergey Kupletsky has created a list of classes that incorporate beautiful styled buttons to any interface quickly and efficiently. Each item is made on the basis of Bootstrap and complies with Material design rules. They are bright, clean and responsive. The concept features four sleek floating action buttons. You can choose the effect for revealing submenu from three available options (slide in +fade, zoom in, fountain). To work the solution into your project, you need to copy the code, add it to your files and declare it whenever you need to. shape and tone of a background. Voila, you are ready to download the result. Material Design Lite is a starter kit for creating websites with Material Design flair. It is delivered with templates, standard components (including layouts, navigations, progress bars, toggles, tables and much more), styles for typography, icons, and some customization options. Vince Brown forms the alliance of Material Design and Cards layout and cements it with a generous amount of white space. The two-column blog-style structure dishes up the content in an elegant way, looking stylish and tidy. This is a fast growing online collection of pictograms. They are available in several formats: SVG, Vector, Webfont, XAML, and CDN. The range varies from traditional editor symbols to unique transport signs. 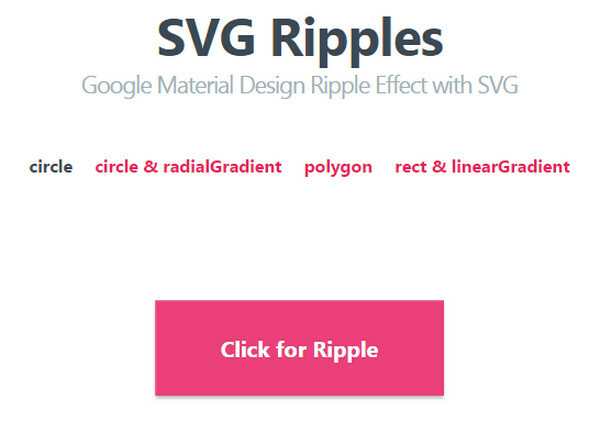 The tutorial walks you through a routine of constructing a replica of a ripple effect with radial action that is a characteristic trait of Google’s buttons. 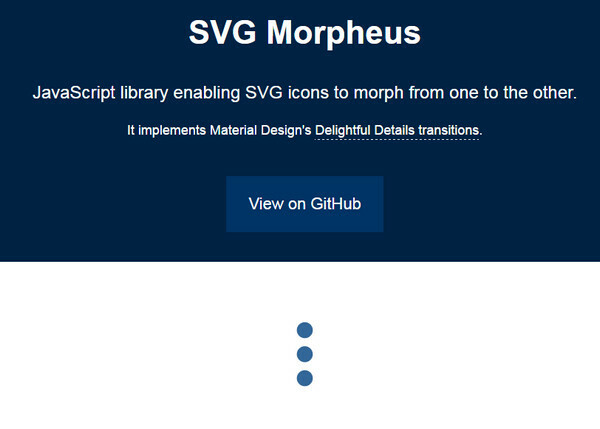 Combining the powers of SVG and GreenSock, Dennis Gaebel has crafted four different versions. Material Design Iconic Font is a Webfont that comprises a lot of icons. 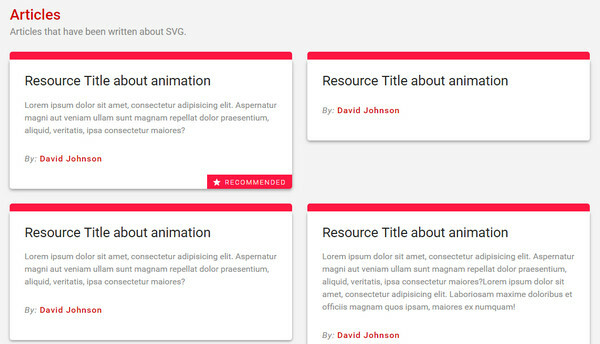 Not only is it suitable for Material Design projects but also for Bootstrap concepts. There are objects that fall into such categories as web applications, notifications, files, editors and much more. 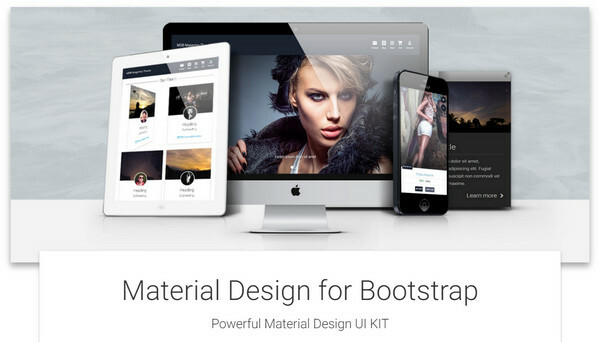 Material Design for Bootstrap is a massive bundle of user interface elements. As the nameplate implies, it is made specifically for Bootstrap Foundation. 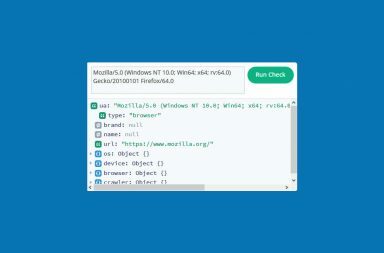 It ships with more than three-hundred components, one thousand icons, CSS-based animations, helpers and much more. The free version comprises all the basic items, templates, and framework. 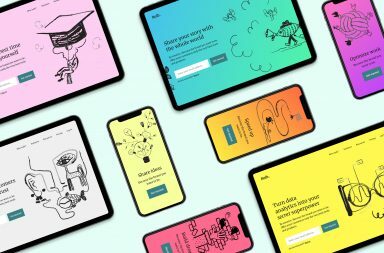 Although Material Design is a complex concept that affects numerous aspects of the interface, it can be effectively handled when you have useful assistants at your fingertips. The listed above tools let generate cohesive color schemes, build themes with trendy features such as FAB or buttons with a ripple effect, and even push boundaries by implementing principles in tandem with other popular instruments such as Bootstrap.